Manipulate and convert the Video files hosted in the cloud. Flexibility to use any language & platform which is capable of calling REST APIs. It is easy to get started with Aspose.Video Cloud for cURL, as there is nothing to install. Simply create an account at Aspose for Cloud and get your application information. Once you have the App SID & key, you are ready to give the Aspose.Video Cloud for cURL a try with any language - on any platform. Aspose.Video Cloud for cURL - some of supported languages and platforms. Aspose.Video Cloud for cURL supports major video formats. An overview of the capabilities of Aspose.Video Cloud for cURL. 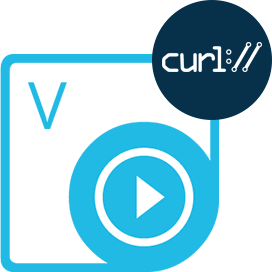 Aspose.Video Cloud for cURL provides method for converting the video into different formats and during conversion, we can adjust video properties such as FPS, resolution, volume level etc. The similar method also supports the feature to add watermark (Text or Image) to the video file. The frameSize property in request provides the capabilities to update/adjust the resolution of video file. The feature to Add audio track to the video file enables you to add an additional audio track and while playing video, the user can switch between these Audio tracks. These files can be in different format or you can use different codecs and the resultant file format will depend upon the extension provided for the resultant file. You can also set different time options for the audio track such as starting position, end position and offset. These options determine the time-frame in video from which the new audio will start playing and you can also specify the point until which it will be played. Get the feature to Append one video file to another video file. The files can be in different format or they can use different codecs but the resultant file will depend upon the extension specified for resultant file (i.e. AVI, MP4, M4V etc). Now concerning to the encoding of resultant file, you can set any supported codec (i.e. x265, x264, WMV etc) or you can leave it default value. Aspose.Video Cloud for cURL also offers the feature to Extract a part of video from input file and save it as a new video file. While extracting the video, you need to specify the time position in milliseconds from which the extracted part will begin and also the duration in milliseconds for the extracted part (how much milliseconds should be extracted). Why Aspose.Video Cloud for cURL ?